SAP Analysis Office is designed to let you run ad-hoc analysis of OLAP sources in Excel, to connect seamlessly with SAP Business Warehouse and SAP HANA and power real-time analytics, and to embed you findings into live PowerPoint presentations for sharing. The APOS Live Data Gateway makes thes SAP solution even more powerful through extended data connectivity. 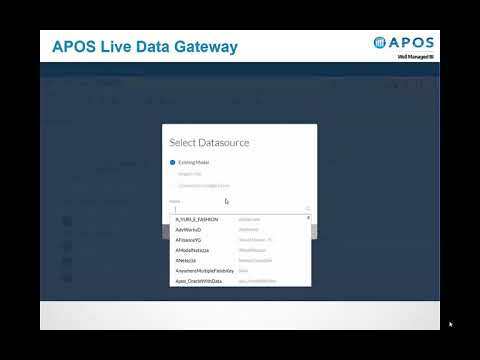 The APOS Live Data Gateway is a data connection and data transformation solution that enables live data connectivity and expanded data source options for SAP Analysis Office. With the APOS Live Data Gateway, there is no need to refresh or re-acquire data. You are connected to a live data source. You can choose from a wide range of enterprise data source types. The live enterprise data you use to populate your stories remains safely behind the corporate firewall. You use SAP BI credentials to access the data and all database security is respected by the APOS Live Data Gateway. In Live Data mode, there is no need to recreate data models. Your stories use the existing data model and relationships in the enterprise data source to which you are connected. There is no need to install the APOS Live Data Gateway on client machines or on your SAP BusinessObjects server. It runs on a Tomcat server and brokers and serves data requests from your BI Launchpad. Your data stays behind the firewall, leveraging your existing network security to protect your enterprise data. Use the APOS Live Data Gateway's connectors to make your enterprise data sources available for your SAP Analysis Office projects. 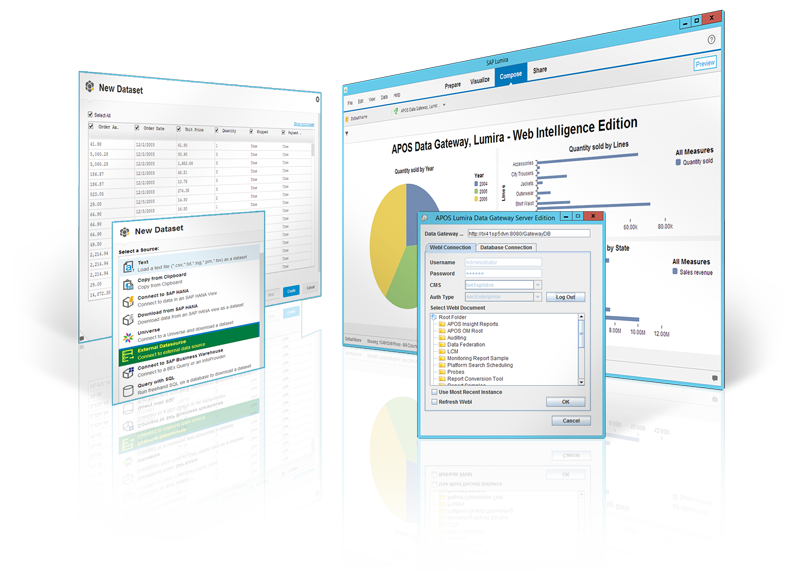 Use APOS Views to transform your enterprise relational data sources to meet the needs of your SAP Analysis Office projects.. The APOS Live Data Gateway's Direct Data Connector simplifies the process of building stories and populating dashboards and reports. There is no data modeling required before you construct your stories, because the APOS Data Gateway uses the data model and security model that are deployed in the source database, significantly reducing the time it takes to achieve story objectives, and dramatically improving end user adoption. The APOS Live Data Gateway connects quickly and easily to BW, with no changes required to the BW environment. Just connect and start building your stories. Universe queries returning multiple data flows are supported. The APOS Live Data Gateway merges data flows on the fly and serves them to the user. If you don't see the data source you need on our list, contact us and we'll work with you to make it a reality. Make relational data sources more cloud-friendly. APOS Views provide a semantic layer between your enterprise relational data sources and your SAP Analytics Cloud stories, allowing you to implement measures and dimensions.